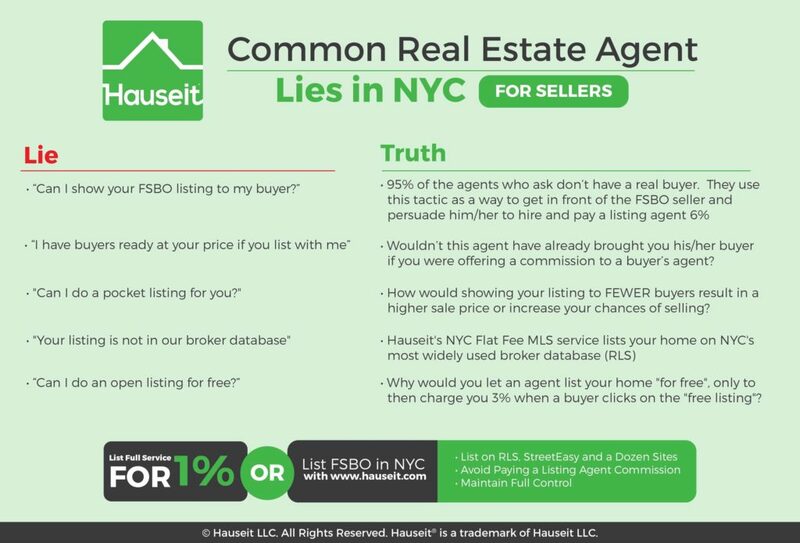 The most common real estate agent lies in NYC are told to home sellers, especially when an unethical broker is trying to solicit a NYC FSBO home seller to become a new listing client. Broker solicitation is the tip of the iceberg when it comes to common real estate agent lies in NYC. In this article, we highlight some of the most infamous lies that NYC agents tell to buyers and sellers. We’ll also explain how you can avoid paying the “standard” 6% commission to sell your NYC apartment, as well as how to earn some of the buyer’s broker commission through a rebate when it’s time to purchase your next co-op or condo apartment in New York City. NYC Real Estate Agent Lie #1: Can I show your FSBO listing to my buyer? Home sellers braving it alone through a traditional FSBO sale will hear this lie hundreds of times before they give up or sell to an unrepresented buyer (What’s the FSBO success rate in NYC?). This agent from [redacted; major NYC brokerage] showed up to my last open house without a client and tried to pitch me her services while I was trying to show my apartment to walk-in buyers. She told me she was previewing for a buyer client who would be in town next week. I naively agreed to meet with her and her buyer this Monday at 2pm. Monday 2pm comes and goes and no one shows up nor did I receive any heads up from her. Then at 2:10pm a male agent from her brokerage shows up with some absurd excuse: “the buyer got stuck in a cab and couldn’t make it, so I wanted to stop by just as a courtesy.” Pretty bold lie considering I asked him to his face “who are you, you are clearly not an Amy?” He then proceeded to come in and try to pitch me their listing services. It’s unbelievable. I straight up told him to leave. Yesterday, before you got involved. One of [redacted]’s agents was supposed to bring a buyer to see the apartment. Neither that agent nor the buyer showed, but Ms. Kaplan showed late and gave me a lame excuse that the agent had to suddenly go out-of-town, and the buyer couldn’t make it. Ms. Kaplan asked if the windows had to replaced. I told her not to my knowledge, although one or two may need some adjustments. When I asked why she thought that, she quickly asked me if the electrical had to be upgraded. I told her it was upgraded years ago, and asked her why she thought that. I got a blank stare. She wasted my time. Yes, at the time she showed up, I told her I had no intention of paying anybody a commission, particularly her. That was before our arrangement. It’s our exclusive now. 2.5% commission to buyer’s agents as listed in RLS, not 3%. Do you have a buyer for us? I spoke with the owner of this apt he told me he is not paying any brokerage commission but I see that you have it listed at a 6% commission. Is this correct? This is clearly one of the toughest situations traditional NYC FSBO home sellers face. If they attempt to minimize harassment by writing “no brokers please” on their listing, they risk a complete boycott from agents representing real buyers. That’s a serious concern considering agents represent over 90% of all home buyer traffic. However, if they write “seller willing to work with buyers’ agents” or “will pay 3% commission to buyers’ agents” on their listing, they still will get boycotted by buyers’ agents. The primary reason given by agents for this is that most agents representing buyers do not have any sort of exclusive agency agreement with their buyer. As a result of this lack of a formal arrangement, the buyer’s agent cannot reasonably be expected to work for free. No one in their right mind would risk a 3% commission payday by introducing a FSBO listing to their buyer. It would be too easy for that buyer to just Google the address to realize that they can loop out their agent! Because there is no formal mechanism to ensure payment of a buyer agent commission when dealing with FSBO sellers, there is little incentive for buyers’ agents to risk losing their clients by introducing them to a FSBO seller. Only in very rare instances where a FSBO property is the only one on the market that meets a buyer’s criteria, and the agent feels that the buyer is about to give up, will a buyer’s agent dare to show a FSBO listing. Even then, the buyer’s agent will first need to make the owner sign a one-time showing agreement before risking an introduction. Unfortunately, in either scenario, whether the traditional NYC FSBO home seller chooses to engage buyers’ agents or not, they will be bound to be harassed by a large portion of the 50,000 licensed real estate agents in NYC who do not have clients and who have been trained to target FSBOs as a source of potential clients. This lie is especially egregious when an unscrupulous and reckless agent attempts to solicit an Agent Assisted FSBO home seller. It is unscrupulous because it is an illogical statement which should be insulting to an educated, intelligent NYC home owner. If you listed your home via an Agent Assisted FSBO then a Hauseit affiliated REBNY Member Firm has already advertised your home on all broker databases and public real estate search websites, just like any other traditional REBNY Member Firm. Because your listing is in RLS, every other REBNY Member Firm is contractually entitled to the offer of commission to buyers’ agents listed in RLS. As a result, all brokers and buyers will see your listing. Do you really think this agent who has time to solicit you in person at an open house has a roster of buyers who do not use the internet and solely wait for his call? As an intelligent NYC home owner, you should probably realize immediately that this guy might not have any clients at all. Otherwise, why would he show up to solicit you on a Sunday? If he had buyer clients he would be out with them trying to close a deal. If he had seller clients he would be hosting an open house. A Pocket Listing is a private home sale where the listing agent sends details of the sale by email to his or her network of agents and buyers. The home is not publicly advertised on any real estate search websites nor is it included in the RLS or MLS broker databases. This is an alternative to the common lie we just explained. We had an Agent Assisted FSBO client tell us that he was solicited in this manner by an agent neighbor in his co-op building. The customer was not receiving a lot of interest because he had committed one of the top 3 mistakes and reasons why FSBO sellers fail. He was pricing his Midtown apartment at almost 2,400 PPSF in mid 2016 which is extremely overpriced. Sensing weakness, the agent neighbor told him in the elevator that he should take his listing off market for a month and let him try to sell it via a pocket listing. The agent neighbor claimed to have a Rolodex of buyers lined up ready to buy the apartment at that price. If you’re not furious already at the dishonesty of this statement please read it again. As an educated NYC home owner you should not need anyone to explain how ludicrous this statement is. The seller should have been furious at the implied insult to his intelligence; furthermore, what does this tell you about the honesty or competence of the agent making this claim? The RLS (REBNY Listing Service) is the primary inter-brokerage database of shared property listings in NYC. The only way for brokers to access RLS data is through RLS vendors like Nestio, OLR, RealtyMx and RealPlus. Once a listing is submitted to RLS it will automatically syndicate to all RLS vendors including brokerage specific databases like Taxi and Limo. Oh really, then how did you find it and manage to reach out? This is one of the most humorous and infantile of common real estate agent lies in NYC. This statement is even more juvenile when made to an Agent Assisted FSBO home seller whose listing has been syndicated from RLS automatically to all the various RLS vendors like OLR, Nestio, RealPlus and RealtyMX. The larger NYC brokerages may have their own proprietary listings databases (i.e. Taxi, Limo etc.) which pull data from RLS and other sources like StreetEasy and Zillow in order to be as comprehensive as possible. This makes sense as brokers will want as comprehensive a list of properties as possible for their buyer clients, even traditional FSBO listings. We once heard an incredibly malicious story from a seller who was told by agents from one of the biggest brokerages in the city that they only show their buyers listings from each other among the biggest 3 firms. Not only was this a particularly dangerous and reckless statement to make by the agent (this is a direct violation of US Anti-Trust Laws) but it was illogical and insulting to any rational human being. As of June 1, 2016 the three largest brokerages in NYC controlled 6,932 of 14,924 total current for sale by agent listings. That represents roughly 46.5% of the market. How long do you think buyers will stick around if they were only shown less than half of the available market inventory? Sellers in Manhattan and Brooklyn know that their boroughs are not exactly known for having excess housing inventory and websites like the New York Times, StreetEasy or Brownstoner are extremely efficient for buyers to search by themselves. Without further belaboring the point, it is impossible for a REBNY Member Firm to not participate in RLS (REBNY Listing Service) or opt-out of seeing certain REBNY Member Firm’s listings. To even speak of such select boycotting is punishable by Federal Anti-Trust Laws. 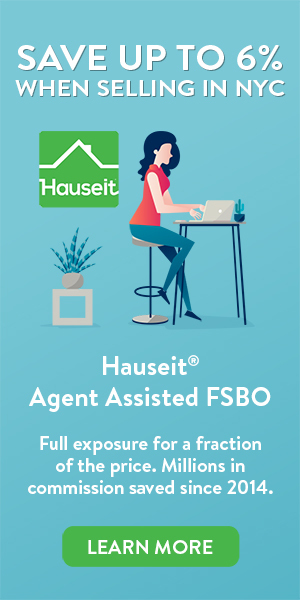 If you’ve listed via an Agent Assisted FSBO with a Hauseit affiliate broker, your listing is visible to every single NYC broker and home buyer. If for some reason a buyer’s agent doesn’t initially suggest your property, the buyer will suggest it to his agent when he sees the listing for himself online (remember 98% of buyers today start their search online). Do not waste your time being lied to by the occasional junior agent who solicits you at your open house. November 15, 2017 Update: Agent Assisted FSBO customers receive virtually no broker solicitation or harassment because all of our partner brokers are brand name, full-service, traditional real estate brokerages with great relationships with the wider brokerage community. None of our REBNY Member partner brokerages openly discount or under-cut their brands in any way. This means you won’t be treated any differently by other traditional brokers with whom our partner brokers work with every day. As a result, any rebate or discount you receive will be our little secret! NYC Real Estate Agent Lie #5: Can I do an open listing of your home for free? Because the traditional real estate model is hyper-competitive with 50,000 licensed real estate agents in NYC fighting over 5,000 closed deals per year, some agents may cleverly attempt to trick home owners into doing an “open listing” with them for “free.” The conniving agent will offer to list your home on popular websites such as StreetEasy, Zillow and Trulia without any sort of listing agreement. Be careful however. An open listing is free in name only. Your cost will be potential buyers which you could have gotten directly without the intermediation of this “generous” agent. Without some sort of listing agreement in place an unscrupulous agent could steer the buyers away to purchase something else or attempt to charge you 3% commission for bringing you a buyer. This is why it’s extremely important to work with a trusted, well-known FSBO company like Hauseit whose partner brokers have an established reputation of excellent customer service. Never hand over your home sale to a shady mom and pop discount broker! This pitch will often be made to NYC FSBO home sellers who’ve only listed their home on Zillow, a popular and free national real estate search website. However, Zillow is not very popular locally in NYC where the real estate search market is dominated by buyers’ agents and local search websites like the New York Times, Brownstoner and StreetEasy. As a result, a devious agent who tricks a NYC FSBO home seller into agreeing to an open listing will be collecting the vast majority of NYC buyer leads directly to him or herself. Who knows if those buyer leads will ever get to the home owner and even if so, for what cost? Hi I think I can pull the images and description from your other listing of that is ok for the open listing. I would just need a ok and need to know what the percentage was that you are offering to buyers brokers. Hey guys – this is definitely not okay and not in your best interests. She’s basically “offering” to steal your leads by posting your listing on public sites like Zillow. Why would you allow her to do that when it’s already on all public sites (and you get the leads directly)? All text are taken verbatim from actual email exchanges. Please note the professionalism of our affiliate’s response versus the sloppy grammar and spelling of the troll agent. In contrast to the majority of NYC’s 50,000 licensed real estate agents without barely a high school education, our affiliates are all extremely professional and competent with backgrounds in investment banking, institutional sales, management consulting and law. You are in much better hands with Hauseit than you ever will be with someone else who can barely count the 6% they’ll charge you! This common lie is told over 100,000 times a day in NYC (there are 50,000 licensed real estate agents in NYC with 30,000 of them in Manhattan) by agents to unsuspecting first time home buyers. It is true that the buyer does not directly pay their buyer’s agent and the seller pays 6% of the sale price in total broker commission split equally between the listing agent and buyer agent. However, because the seller is required to pay 6% regardless of whether there is a buyer agent involved or not, you can imagine that the broker commission is already built into the sale price. So while you may not pay your buyer agent directly, you are in effect paying for it through a higher purchase price! Have you ever wondered why over 90% of transactions in NYC are done between two agents (meaning both the buyer and seller are represented by an agent)? Have you been shocked by this statistic after learning that over 98% of home buyers start their search online? If so many home buyers start looking by themselves on popular websites, why do so many of them end up becoming represented by buyers’ agents instead of easily avoiding buyers’ agents? The answer becomes clear once you realize that every listing agent is also a potential buyer’s agent. The moment home buyers begin searching by themselves and contacting listing agents, the listing agents will reach out and try to poach them as a buyer client, either as a purchaser of their own listing or something else. NYC Real Estate Agent Buyer Lie #2: I’ve never heard of a commission rebate, are you sure it’s legal? The most common real estate agent lies in NYC are a result of willful non-disclosure. Unfortunately for most home buyers, their real estate agent friends will never ever mention to them the possibility and complete legality of receiving a buyer agent commission rebate. It is not surprisingly that the 50,000 licensed real estate agents in NYC have collectively buried this piece of news from consumers. No matter what the actual law says, it’s tough for the Attorney General to get the word out if there are 50,000 salespeople running around casting doubt on the legality of providing a rebate. From a practical standpoint, a typical buyer’s agent will only make 0.5% instead of 3% on the standard sale if they give away 1% in a commission rebate. That’s because most licensed real estate salespersons have a 50% commission split with their brokerage. May we advertise the incentive in order to attract new clients? Can the incentive be in the form of a gift card or be monetary in nature? Is there a limit on the dollar amount that can be offered to potential clients? Yes, you may advertise the incentive you wish to offer. There is nothing in New York State law that prohibits Brokers from advertising an incentive in order to attract new clients. With that said, Brokers should make sure that the advertisement complies with the relevant New York State advertising laws and regulations and not be deceptive or misleading. Yes; moreover, the incentive may come in various forms including cash, check, gift cards, services or other gifts. For example, Brokers may offer a Party to the Transaction a $2,000 Amazon gift card or a new laptop computer as an incentive to work with the Broker. No, there is no prescribed limit on the amount of the gift which Brokers may offer. Brokers may offer an incentive directly to a Party to the Transaction in whatever amount Brokers would like.